Technorama is an award winning audio podcast that takes a light-hearted look at tech, science, sci-fi, and all things geek. Chuck Tomasi and Kreg Steppe have a good time covering odd and quirky news stories that many blogs, and most podcasts don’t cover. It’s like hanging out with your geeky friends and having a good time. Here’s a list of some of the fun topics Chuck and Kreg have covered since starting in 2005. Did I mention awards? 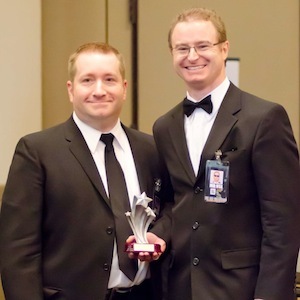 Technorama was a finalist for a Parsec Award for excellence in podcasting in the technology category in 2007 and a 2011 winner of a Parsec Award for best comedy/parody podcast. Chuck Tomasi is an IT professional with nearly 30 years experience in a variety of topics from networks to databases to programming to management. He is a recognized leader in providing innovative and effective IT solutions to global Fortunate 500 organizations. He hosts several podcasts hosted at chuckchat.com including Freestyle, Radio Yesterday, and Gmail Podcast. Chuck is also the co-author of Wiley Publishing’s Podcasting for Dummies. In his spare time he has served as the VP of Communications and President of his local HDI chapter, Titletown HDI and founder of the Fox Cities Managers group. In 2011, Chuck also received his 2nd degree black belt in karate. 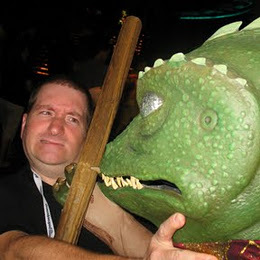 Not only do Chuck and Kreg host and produce Technorama, they also collaborate on another podcast, Interface To Face, dedicated exclusively to in-depth interviews. 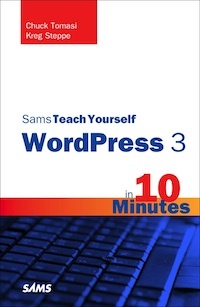 Chuck and Kreg are co-authors of Pearson’s Teach Yourself WordPress in 10 Minutes and the follow up Teach Yourself WordPress 3 in 10 Minutes and host the companion podcast Teach Yourself WordPress in 10 Minutes… in 10 Minutes.